Sam Cook was one of my first favorite slam poets. When I first saw him, he’d recently moved to Minneapolis from Colorado, and I didn’t realize I was attending my first poetry slam. Sam is an incredible writer, a dynamic performer, and puts a lot of time and effort into supporting the local slam scene. Sam runs the Saint Paul Soapboxing poetry slam. Sam, a National Poetry Slam Champion, received a B.A. in Linguistics from the University of Minnesota. He is the founder of Button Poetry, which co-produced and cast the Poetry Observed video series. He currently works performing and teaching poetry in middle schools, high school, and colleges around the country. In addition to competing in and coaching adult-level slam at Soap Boxing, Sam is also highly involved with collegiate slam in the Twin Cities. Sam founded the University of Minnesota slam program in 2009, which he then coached to College Nationals (CUPSI) finals stage in 2010 and 2011. Sam now coaches for Macalester College, which took 2nd place at the same tournament in 2012. 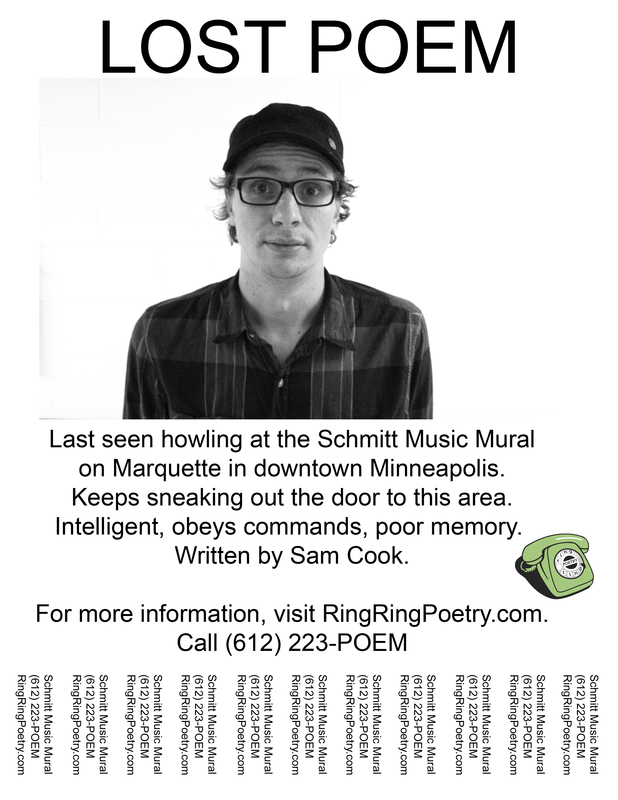 Sam’s poem takes place at the Schmitt Music Mural on Marquette. “Like other American cities of the 1970s, citizens and business owners in Minneapolis were concerned about beautifying the older downtown buildings. Schmitt hired the repair of the old bricks and bricked up 32 exterior windows. He asked a company employee to choose notes from a musical score that could be painted as a mural over the enormous facade. The employee searched through the store’s sheet music and came up with the most graphically attractive piece of music she could find, Maurice Ravel’s “Gaspard de la Nuit.” Pianist Van Cliburn posed playing a Steinway concert grand piano in front of the mural for a now famous photograph, which attracted the attention of national newspapers.” “The concert this piece is from, has three parts, that were based on poems, the bits on the wall belonging to the third movement, called Scarbo, about small vision of the devil. The music on the wall is said to be scattered with jokes for musicians.” The are rumored to be sections out of order. Phone 612 223-POEM to hear Sam’s poem.